Pregnancy Announcement Messages : Pregnancy is the best period of a woman’s life. The joy of carrying a new entity inside yourself can be hard to describe in words sometimes. The news of your being pregnant means so much to your close ones, especially to your husband, family members and friends who really care. 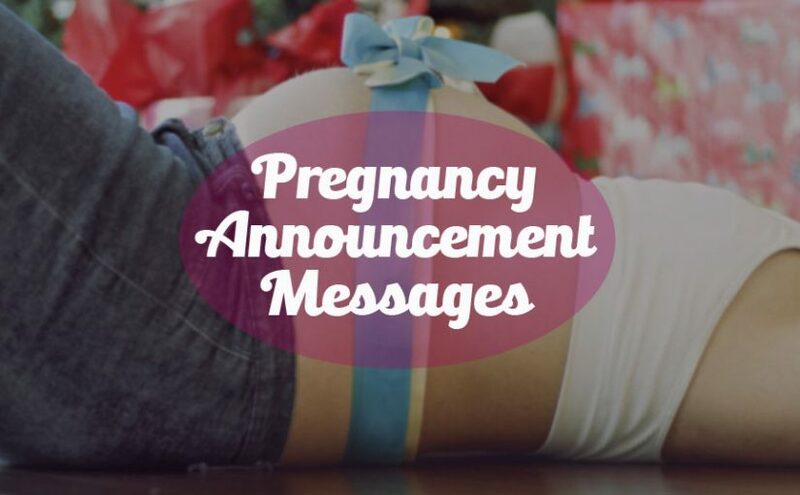 It’s your duty to let them know of this good news with some creative, funny or wonderful pregnancy announcement messages. But you may sometimes come short of suitable words to announce your pregnancy in a creative way. I’m pregnant texts are great for you to share this great news with your loved ones as well as on social media like Facebook, Twitter, Instagram etc. Here are some creative, funny and awesome pregnancy announcement messages for you to let the world know about the incredible news of your pregnancy! It’s time to add a new branch to our family tree. Its time we all celebrate the miracle of motherhood. I’m expecting a new member in our family. The wonderful nine months of motherhood has finally started for me. I never knew growing a fat tummy would be so enjoyable. Hoping for the best! My cloths are getting tighter already. Come on now congratulate me for the biggest achievement of my life. I’m going to be a mother soon! I have never felt this much happy before. I’m going to give my sweet husband the best gift in his life. The countdown begins from now. We are going to need an extra bed for a special someone. I wish you knew how much happy I feel right now to let you know the good news. I’m pregnant! I don’t know the right words to express my joy right now. I just went back from the hospital and its official now. I’m expecting a baby soon! My life was happy but not complete. I thank God today because he has blessed me with the most precious gift. I have conceived a baby and it’s a matter of nine months now! We are just a couple of months away from receiving the biggest gift in our life. Come share the happiness together as we plan for the best welcome party for the baby. We are eagerly waiting to welcome a new addition to our family. Proudly announcing that we are expecting a baby for the first time! Pray for both of us! This is the day we both had been waiting for so long. We are so glad right now to let you know that we are expecting a baby. Pray for us! Giving birth to a baby may be the most challenging part in a woman’s life. Thank god I’m already prepared for the challenge. Announcing my pregnancy to all of you! The most beautiful experience in the world is knowing that you are about to be a parent! Can’t wait to welcome my bundle of happiness anymore! A baby is coming soon to light up our sweet little home. Keep us in your prayers. Looking forward to give you a big surprise! No feelings can match the joy of bringing a life into this world. The journey of long nine months is getting more and more awesome every moment! It’s just a matter of months before I welcome my special gift from god. I feel blessed every time I think of it. Keep me in your prayers. Being pregnant is the only time when your husband actually appreciates you for being fat. I’m enjoying these precious moments so much! The funniest part of pregnancy is you get personal servant 24/7 for the next nine months. And that’s you husband. Yes dear, that’s what you get when you make a woman fat! If I wasn’t pregnant, I would never know healthy foods are this much boring and tasteless. I really want to shift back to my fast foods now! I’m all prepared to say goodbye to my freedom and sleep. And guess what, everyone is just so happy about it. Sweet pregnancy they call it! Mood swings are at their best as I go through the incredible journey of pregnancy. So, don’t blame me if I’m being weird and mean to you. 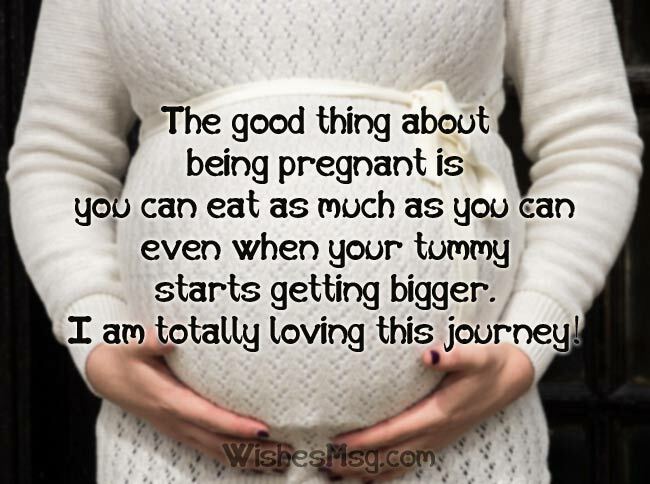 it’s all for the sweet pregnancy! The good thing about being pregnant is you can eat as much as you can even when your tummy starts getting bigger. I am totally loving this journey! Becoming a proud parent was all I dreamt of in my entire life. The time has finally come as I embark on the first milestone of motherhood today. I have conceived a baby for the first time! I’m not afraid of the delivery part. I’m afraid of the raising part. Pray for me so I could raise a happy healthy and modest baby! The best part of pregnancy is getting the dishes cleaned by your husband. If making a woman pregnant is what they are so proud of, so be it! Being pregnant with a baby is the biggest gift any woman can get from God. Announcing your pregnancy to the world in the most creative and funniest way can be the best thing you can do to surprise them.